You can change the background of columns or a row on an interior page. The color you select will be picked up by modules in those regions. All color combinations are pre-tested to be ADA/508 compliant. This article is about changing the color of a row. 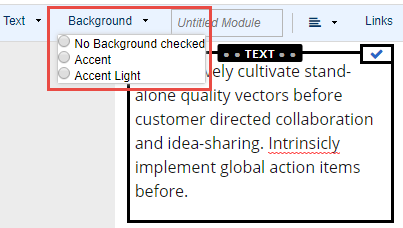 To add a background color to any Text Module, select the module by clicking on it once, then use the Background menu on the toolbar. The Accent and Accent Light colors are determined by the color palette selected for your template. With darker color backgrounds, the text will also change colors (usually white) to maintain 508 compliance. From your Site center, edit any interior page. Click the + sign in a column or above module, and add the layout module. Select 100%. 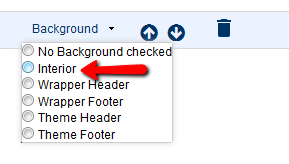 Select the row you just added (all layout modules are rows), and use the toolbar to select a background color. The background color is the same one used for other regions of the site. Interior pages are almost always white. Select the column instead of a row. The Row will add to the module location. Make sure Row is selected. Go to the Toolbar and select Interior. Go to row and select inner module to select Column. If the Insert Module screen opens, close it. Go to the Toolbar, click Background and select either Accent or Accent light for your color choices. The accent will always be the primary color and Accent Light will appear as a light grey color. Add padding to allow space between modules. After selecting a color choice, that color will appear in Column.